 Scott (Burning Bright, 1993) offers a low-key cyberpunk mystery set a century in the future when computer networks have become the turf of a diverse group of businesses, users, and ``netwalkers.'' India Carless's sedate life as the ``syscop,'' a combination system administrator and security officer, for a small art co-op has been disrupted. Someone is bragging about system break-ins and using the alias Trouble, which India used in her semi-outlaw days. She wants to get her good name back so she enlists the help of the hackers she ran with before she went straight. 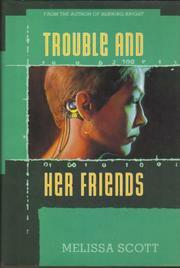 Her former lover and partner-in-crime, Cerise, gets dragged in when the new Trouble breaks into her company's system. Soaring and slipping through the network, working from both sides of the law, they intercept messages, make friends and enemies, visit some unusual places, and cut deals that enable them to track their nemesis. Supported by their colorful friends, mostly gay and lesbian hackers, the retired ``crackers'' stumble to success, being more lucky than good. Scott makes a strong effort to recreate the sensation of virtual reality--but fails. Yet her characters are sympathetic despite themselves, and the near-future, neither utopian nor dystopian, is effectively created.